Sarto Rocheleau - New For Wire wheels42mm size spinners This is a one piece Knockoff tool kit that fits the two eared 42mm size for wire wheels. 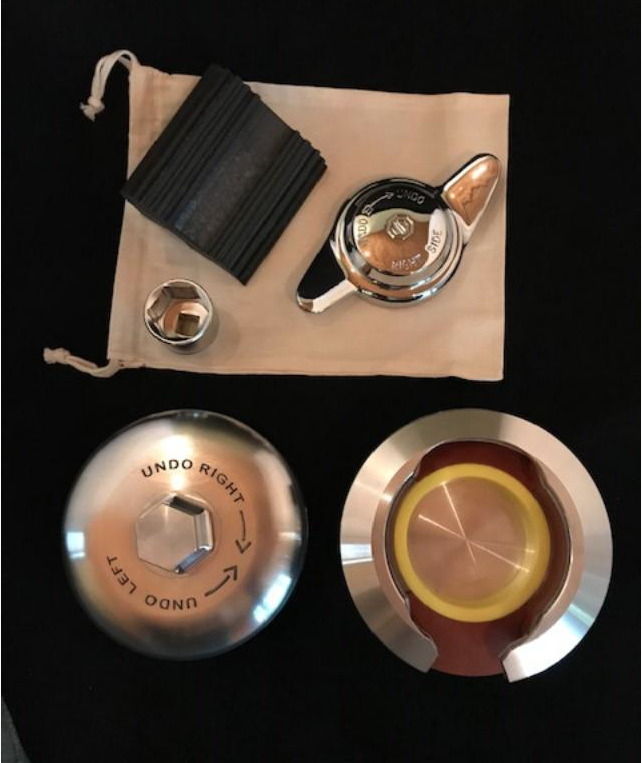 It is leather wraped to protect all metal to metal contact 52mm size spinnersThis is a one piece Knockoff tool Kit that fits the two eared 52mm size ﻿spinners on Jaguars and Aston Martins ﻿using wire wheels. It is leather wraped to protect all metal to metal contact ---------------------------------------------------------------------------------------------------------------------This is the Old version and is no longer made due to higher cost﻿ with too many moving parts﻿﻿Size 42mm amd the 52mm size versions are no longer being made and have been replaced by the newer one piece tool. see abovePart number # 701 Price $300.00 US Dollars﻿ ﻿ Morgan wire wheel & spinner INSTRUCTIONS for the two eared spinners Helpful tips for using this two eared tool. Hook one ear of the spinner on the bridge part of the tool then lay the tool flush to the spinner and turn either direction. UNDO Left and right turn to the front. To tighten to the rear. I've heard of different thoughts, I use what is labeled on the spinners, unless the hubs were installed wrong. 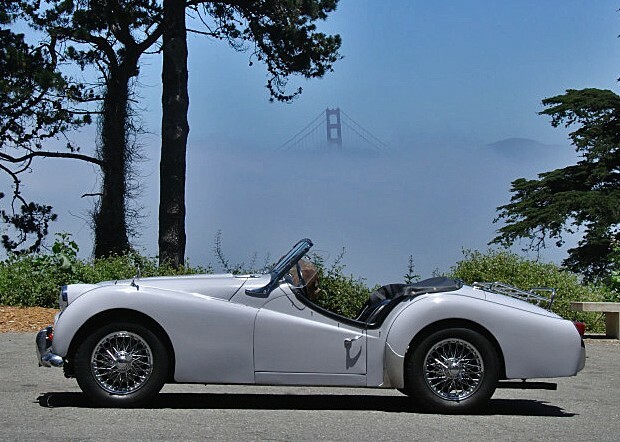 Use the proper Torque LOTUS ELAN did publish in their early manuals a torque setting of 160 to 180 ft/lbs and in a later manual showed 200 to 220 ft/lbs. Lotus was the only one and I mean the only car company or wheel manufacturer that did not suggest a lead hammer.I have been told that on the two eared spinners, just secure finger tight and three good whacks with a lead hammer does it. An experienced guy using a lead hammer was able to hit about 210 ft/obs each time. He also said you can tell by the sound when it is tight. Over tighen apinners could weaken the threads.I suggest to consult with the car manufacturer and/or the knockoff wheel suppliers for their suggested settings, if you can find one let me know. 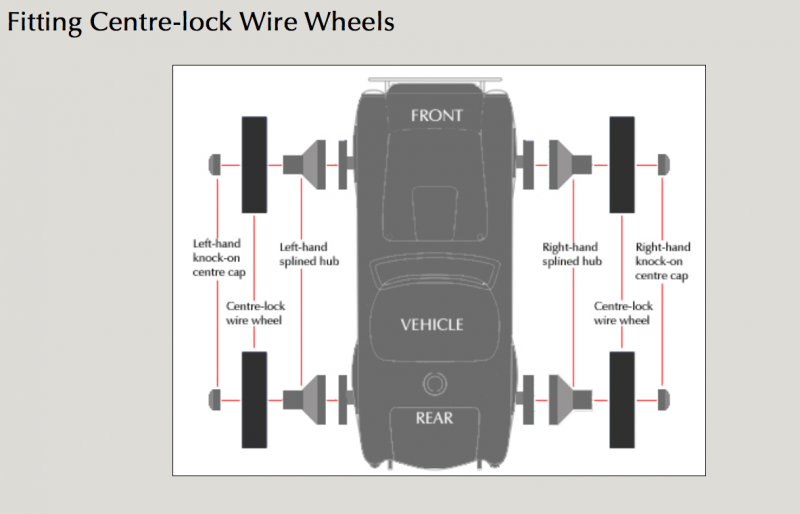 The manufacturer's suggested method of securing spinners. It is a guess of how much torque has been beat on the spinners. ﻿Trying to remove over tighten spinners, in this high risk method, seems to be one of the biggest complaints. With an occasional replacement of a lead hammer.﻿﻿﻿ A 1959 TR3A looking exceptional, better in person! This wheel well is a good example of how close the spinner is to the wheel well. A hammer swing could hit the body or the spokes. At some point you'll have to swing the hammer horizontally. By making a less controlled swing it is easy to glance off and do damage. Another example of a Jaguar body that requires a tool that does not use a hammer. A beautiful Jaguar Coupe Reach in and hang the tool on the spinner's ears and torque them tight in the deepest of wheels. A well used spinner that has been hammered on. This spinner tool will protect your new spinners. Jaguar 52mm and a smaller 42mm spinners. If your spinners look like these, and the side view pictured below, the knockoff spinner tool will fit. Helpful tips for using this two eared tool. Hook one ear of the spinner on the bridge part of the tool then lay the tool flush to the spinner and turn either direction. UNDO Left and right turn to the front. To tighten to the rear. I've heard of different thoughts, I use what is labeled on the spinners, unless the hubs were installed wrong. LOTUS ELAN did publish in their early manuals a torque setting of 160 to 180 ft/lbs and in a later manual showed 200 to 220 ft/lbs. Lotus was the only one and I mean the only car company or wheel manufacturer that did not suggest a lead hammer. I have been told that on the two eared spinners, just secure finger tight and three good whacks with a lead hammer does it. 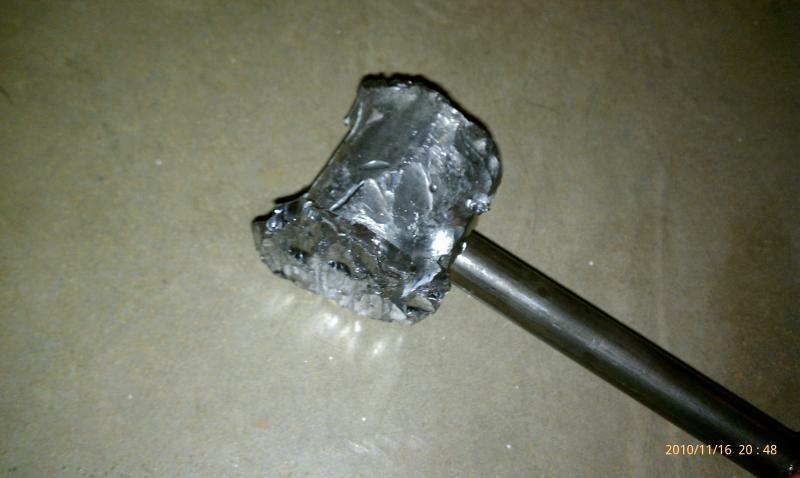 An experienced guy using a lead hammer was able to hit about 210 ft/obs each time. He also said you can tell by the sound when it is tight. Over tighen apinners could weaken the threads. I suggest to consult with the car manufacturer and/or the knockoff wheel suppliers for their suggested settings, if you can find one let me know. A 1959 TR3A looking exceptional, better in person! This wheel well is a good example of how close the spinner is to the wheel well. A hammer swing could hit the body or the spokes. At some point you'll have to swing the hammer horizontally. By making a less controlled swing it is easy to glance off and do damage. Another example of a Jaguar body that requires a tool that does not use a hammer. Reach in and hang the tool on the spinner's ears and torque them tight in the deepest of wheels. A well used spinner that has been hammered on. 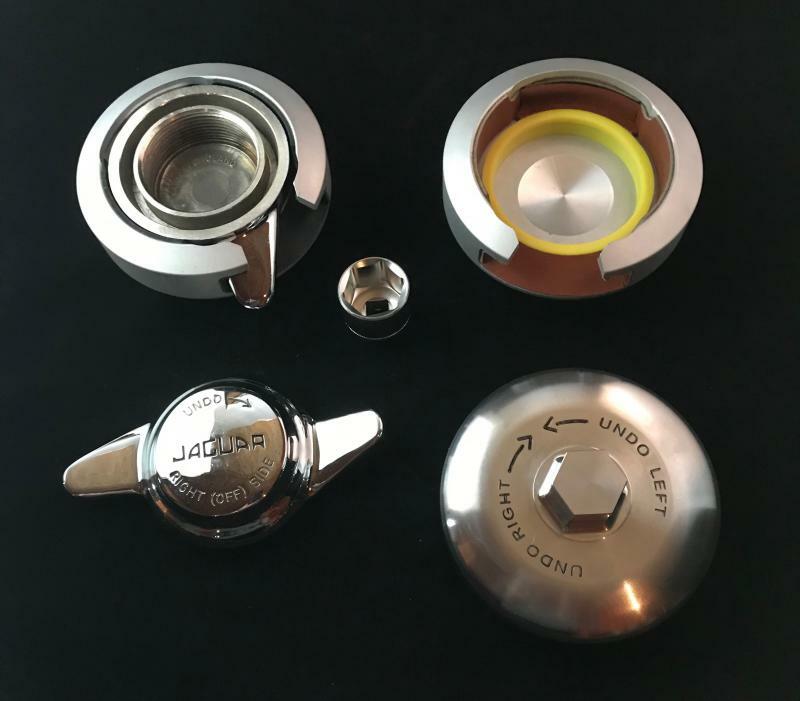 This spinner tool will protect your new spinners. Jaguar 52mm and a smaller 42mm spinners. If your spinners look like these, and the side view pictured below, the knockoff spinner tool will fit.